Casting into Mystery celebrates the meditative sport of fly fishing, rejoicing in the camaraderie and quietude to be found not only in the gentle flow of river currents, but also in the community and culture of anglers past and present. In Casting into Mystery, writer Robert Reid and wood engraver Wesley W. Bates—avid anglers, both—put ink to paper in homage to the venerable sport of fly fishing. Through text and image, they recall with fondness the ‘company of rivers’ each is grateful to know, providing a glimpse inside a sporting culture teeming with literature, art and music. Part memoir, part objet d’art and part field guide, Casting into Mystery will delight passionate fly fishing practitioners and armchair anglers alike. From "The Company of Rivers"
I have enjoyed the company of rivers all my life. They have been the stitches that have woven the embroidery of my life. It began with the Thames River in my hometown of London, Ontario. I lived within walking distance of the river until I left for university at the age of 21, never to return permanently. For the first decade, I lived four blocks from the south branch of the Thames. I recall being eight or nine years old and making rafts out of pallets salvaged from General Steel Wares, located along the river for four or five city blocks. (I would be the fourth generation to work at the appliance manufacturer.) Accompanied by a couple of school chums, we were Huck Finns ready to light out on our river. Later I lived a block from its forks, where the north and south branches converge in the shadow of Museum London, the historic County Court House and Labatt Park, the oldest continuously operating baseball park in the world. The area was once known as Skunk’s Hollow. I crossed the Dundas Street Bridge for the four years I attended H.B. Beal Secondary School and worked as a bell hop at the Hotel London. Then there was the Otonabee River in Peterborough, where I earned an honours bachelor’s degree from Trent University. Margaret Laurence refers to it in The Diviners as the River of Now and Then that flows both ways. One of my English professors, Barbara Rooke, told me she read one of my essays to Laurence over afternoon tea in nearby Lakefield, where the writer lived in a converted funeral home. In the essay I compared the notion of a river flowing both ways to Coleridge’s ‘Frost at Midnight’, one of my favourite poems. I befriended the St. John River for the 18 months I lived in Fredericton earning a master’s degree in English from the University of New Brunswick while working on construction with a group of men on day parole after being convicted of sundry misdemeanours. I spent nine months in Timmins, located on the banks of the Mattagami River, which was frozen for much of the time I was city editor at The Daily Press—Lord Thompson of Fleet’s crumbling Art Deco dream in the cold heart of mining country. I was introduced to the Grand River in 1984 when I joined the Brantford Expositor. One of my beat responsibilities was covering the Six Nations Reserve, so I came to learn that in 1784 the Haldimand Proclamation awarded the Haudenosaunee (Iroquois), also known as the Six Nations Confederacy, a tract of land spanning 10 kilometres on either side of the Grand, totalling 3,800 square kilometres. The decree was signed by Sir Frederick Haldimand, governor of Québec, in acknowledgement of the support the British received from their indigenous allies in the American Revolutionary War. As my former newspaper colleague Bob Burtt records in his book rare Moments in Time—a history of the rare Charitable Research Reserve in Cambridge, Ontario—the Grand’s series of name changes reflects its history. Those who travelled its route for two millennia called it Tintaatuoa, French fur traders named it La rivière Rapide as early as 1669. It was later known as the River Urse. By the mid-1770s it was La Grande Rivière, and finally the Grand River. I moved upriver two years later when I landed at the Waterloo Region Record. I have lived in Waterloo Region ever since, longer than anywhere else. It is where my sons Dylan and Robin were born. I know the Grand best for the simple reason that it is where I learned to fly fish. Fly rods are instruments of knowledge. The best way of learning about city or forest is on foot. Likewise, the best way of learning about a river is on foot, wading. Wading a river is travelling a living past, traversing the currents of history and geography. Robert Reid is a writer, journalist, and avid angler whose career in journalism spanned forty years. 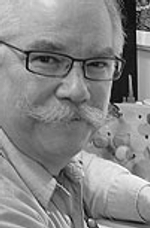 Reid got his start writing for newspapers in Strathroy, St. Thomas, Timmins and Simcoe before he landed a position covering arts at the Brantford Expositor, and later, the Waterloo Region Record. He reported on a wide range of cultural activities from London to Hamilton to Toronto, and served as a lecturer, literary judge and arts commentator, as well as a writer, interviewer and associate producer on a couple of syndicated arts programs produced for television. He was the first non-fiction writer to be appointed Writer-in-Residence at the University of Waterloo. 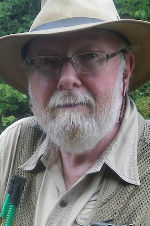 Since his retirement, Reid has continued to write about his passions—art and culture, malt whisky, dining and travel, and especially fly fishing—on his website at www.reidbetweenthelines.ca. Wesley W. Bates was born in Whitehorse, Yukon Territory. One of Canada’s best-known wood engravers, Bates has ventured into book illustration (W. O. Mitchell’s The Black Bonspiel of Willie MacCrimmon), film (Look and See: A Portrait of Wendell Berry), commercial art (the voyageur motif for Upper Canada Brewery), letterpress publishing (through his West Meadow Press) and acoustic country—played, naturally, on a bouzouki. A collection of his engravings, The Point of the Graver, was published to great acclaim in 1994. 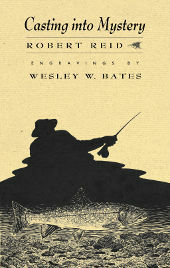 A retrospective of his engravings In Black and White was published by Bird & Bull in 2005, with a revised edition published by Gaspereau Press in 2008. He now maintains his studio, which is open to the public, in a nineteenth-century storefront on the main street of Clifford, Ontario.